It is very important to transmit cheerfulness to others. There was once a land in which the sound of a magic trumpet could be heard everywhere. The music ensured that there would be happiness and joy for all. However, one day, the trumpet disappeared, and everyone in that land ended up feeling sad. 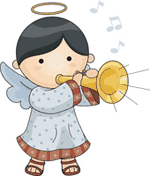 No one did anything, except for a little girl who went off, determined to find the trumpet. She asked everywhere, and then someone took her to see the wise old man of the mountains. The man told her that the trumpet was in the Well of Shadows, and he gave her a violin which might turn out to be useful. When the girl arrived at the Well, she found some musicians next to it. They were playing sad tunes, and she went over to play with them. However, on hearing such sad music, the girl realised that no one, including the trumpet, would want to come out of the well to be greeted by that kind of atmosphere. So she started to play the cheeriest, happiest music she could. She didn't give up, and even managed to cheer up the other musicians. Together they improved the atmosphere around the well so much that the trumpet came out, more joyful than ever. And, once again, happiness returned to that land. Thanks to this, the girl realised the value of offering joy to others, it being the best remedy for those who are sad. And from that day onwards, in that land, anyone who saw someone looking sad would send them their happiest smiles, along with a little music.